It is halfway through October already!! 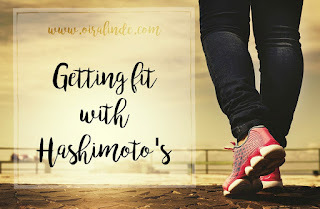 I am also halfway through my Write 30 Days challenge of Getting Fit with Hashimoto's. So how am I doing? Where am I rocking it and where can I improve the second half of this challenge? I am doing a great job of exercising! I have only missed two days so far. One was yoga day (and I am not sold on doing yoga, for Catholic reasons) and I also missed yesterday because I have been battling a blocked milk duct and trying to keep it from becoming mastitis. With that being said, I have been rocking it out with my workouts! I have attacked each one and I have noticed how I am getting stronger in a number of different areas. While I work out at home, I am also working out in karate class and I am getting stronger there too! Punching and kicking the air is cathartic and I don't plan on giving up karate any time soon, especially since the yellow belt test is coming up fairly soon. My diet has been mostly good. I have had gluten about three times in the past couple weeks, and each time after I ate it, I paid for it. You would think I would learn that gluten does not love me! I am hoping to tighten up the meal planning for the latter half of October and stop myself from the fall of the gluten beast. I am feeling fantastic. I don't know if it is the endorphins of working out, the results I am seeing, or the steadier hormones in my body, and I don't care. Being in control of how I feel is empowering and addictive. It makes me want to continue harder and stronger and better than before. I still have a long way to go, but the fact remains that I am feeling healthier now than I did last month. I hope to continue down this path and see where it takes me! Here is to the next 15 days!